On March 11th, an interdisciplinary community gathered at Doe Library to celebrate the opening of No Legacy || Literatura Electrónica The exhibit, co-curated by DH Fellow Alex Saum-Pascual, Assistant Professor of Spanish, and Élika Ortega, Postdoctoral Researcher at the Institute for Digital Research in the Humanities at the University of Kansas, examines electronic literature’s roots in Spanish and Portuguese experimental fiction. 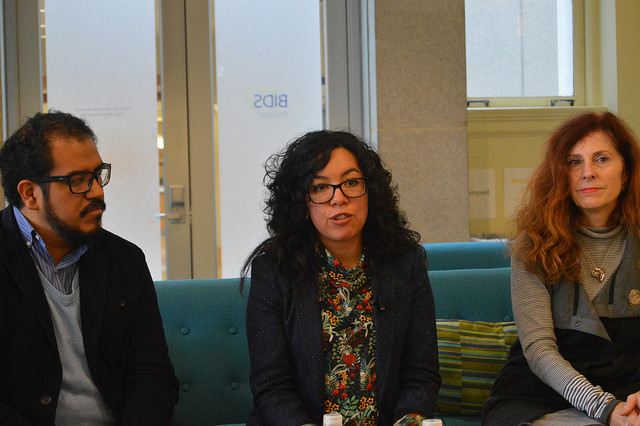 An international set of speakers joined the exhibit’s opening symposium and offered their thoughts on electronic literature, preservation and curation practice, and the field’s transnational and translinguistic characteristics. Dene Grigar, Professor and Director of The Creative Media & Digital Culture Program at Washington State University Vancouver, examined what it means to preserve a work of electronic literature. Grigar is Co-PI for the Pathfinders project, which approaches e-lit preservation by capturing “not just the work of art but also the user’s experience with the work.” To that end, the project has collected an impressive array of hardware, but also a rich audio-visual record that includes traversals of the work by authors and readers. Leonardo Flores, Professor of English at the University of Puerto Rico, Mayagüez, reflected on his editorial work on The Electronic Literature Collection, Volume 3(ELC3), published earlier this year. With ambitions to speak to a global audience, the editors of ELC3 sought to produce a collection that struck a balance between inclusiveness and a high standard for quality. Flores emphasized the importance of diverse editorial boards, where editors can activate author networks in non-English languages and outside of North America. Sandy Baldwin, Associate Professor of English at the Rochester Institute of Technology, discussed his work in seeking out alternative legacies of electronic literature and work to connect underrepresented languages and groups to the burgeoning international community of electronic literature. No Legacy will be on display at the Bernice Layne Brown Gallery in Doe Library until September 2, 2016. Watch the recorded opening symposium on YouTube or explore pictures and tweets from the event.